Creswick Regional Park | Business & Tourism Creswick Inc. 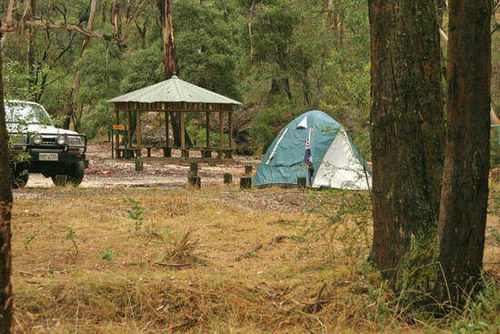 The Creswick Regional Park offers a variety of outdoor activities for all ages in peaceful surroundings. Wood barbecues are provided at most picnic areas, with electric barbecues available at St George's Lake. Toilets and water are available at St George's Lake. The Number 1 free camping ground at Slaty Creek has toilets only. You can camp for short stays at the Slaty Creek area. This is suitable for motor homes as well as tents. Campers should bring their own drinking water and firewood. Panning for gold along Slaty Creek is a popular pastime in the park. All adults must hold a current Miner's Right to engage in fossicking. Remember to fill any holes and leave the area as you found it. Relics must not be disturbed or removed. Click here to purchase a Miner's Right online. Common birds in the area include Grey Currawongs, Crimson Rosellas, White-throated Tree-creepers, Grey Fantails, Thornbills, Robins and Honeyeaters. Two migratory species found in the gullies are the Rufous Fantail and Satin Flycatcher. Koalas and Black Wallabies are common, although they can be difficult to locate. The Koala's main food source is the Manna Gum, a white-trunked tree with hanging ribbons of bark on its trunk. It is common in damper gullies along with Candlebark Gums. Eucalypts growing in the park include Messmate, Manna Gum, Scent-bark, Broad-leaved Peppermint and Narrow-leaved Peppermint. Candlebarks also grow in gullies and are easily recognised by their stark white trunks. Victoria's floral emblem, the Common Heath, is one of the plants frequently found growing under eucalypts. Look for its pink or white bells. There are many plants from the pea family growing, including the rich purple flowered Hardenbergia or "Sarsparilla". Walkers should always stay on designated tracks as there are many deep mine shafts throughout the Park. Popular with visitors, St George's Lake abounds with wildlife. The Lake was once a mining dam used to supply water to the Creswick State Battery for crushing quartz. It was built by hand in 1895 by local tradesmen and today is a popular summer base for water activities. Following the floods of 2010/2011, the Lake was completely drained and a new spillway constructed to protect the town. There is a lookout above the new spillway. The St Georges Lake site is relatively flat. There is a walking track around the lake, offering generally good accessibility. Care is needed during wet weather, as the path can become slippery. A reasonable level of fitness is required for the whole walk. However, there are wheelchair accessible ramps to both the picnic area and a viewing platform further around the Lake. 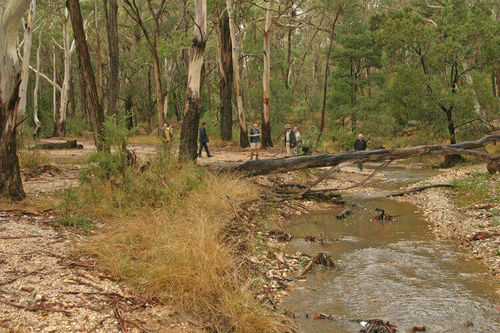 There are three free camping areas with wood barbecues and tables on the creek flats surrounded by tall Manna Gums. The main area has toilets and is more suitable for larger groups. Following John La Gerche's initial efforts, the State established a plant nursery at Creswick (now closed), which operated around the old nursery office. The Creswick Landcare Centre used to operate from this site. Facilities here include electric barbecue and picnic area, Landcare displays, information and educational walks. The site is co-managed by Parks Victoria and Seeding Victoria. Click here to download a copy of the Parks Vic Creswick Regional Park Notes. Click here to visit the Parks Vic website.